There can be no better place than Folly Beach for Thanksgiving. If you’re planning to spend your holiday in the lowcountry, there are places you can go to make your dinner spectacular without having to slave away for hours cooking. Everybody knows that you spend hours cooking only to have it eaten in 15 minutes! Have quality time without wasting precious moments with your family and friends at these great restaurants and enjoy the beauty of Downtown Charleston as well! They are worth the drive and will make your holiday go much smoother with less work. Head to High Cotton on East Bay Street for a prix-fixe menu of either two or three courses of sumptuous traditional holiday fare. An appetizer of freshly made duck terrine served with marinated beets, cream of crab soup, or a crisp shrimp cocktail served with a traditional turkey dinner will cost $50 per person. You can also choose filet mignon, prime rib, grilled scallops or parmesan encrusted flounder for an alternative to roasted turkey. Add a third course for $5 more and dive into creamy creme brulee, warm peppermint chocolate cake or pumpkin pie. For reservations and more information, call 843-724-3815. This beautiful plantation, located on Hwy 61 in West Ashley, is the perfect place to spend a quiet Thanksgiving with your family. 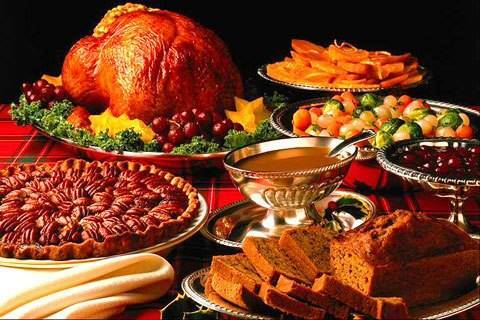 Drive out and enjoy a comfortable holiday lunch buffet including turkey, ham, corn pudding and other delightful casseroles with freshly baked pies for dessert. After enjoying a leisurely meal, wander through the grounds. Make sure to wander through the rice mill, beautifully landscaped gardens, and stable yards. Carriage rides are also available that afternoon. If you’re interested in joining the Middleton Place family for the holiday, contact 843-266-7489. Hours are 11-5pm. Enjoy a traditional Thanksgiving menu at Poogan’s Porch in Downtown Charleston. Smoked turkey with all the fixins are offered for a set price. An extensive menu of short ribs, ham, duck, and filets offer alternatives for those who are seeking something a little different. Luscious homemade desserts are made daily and will close out the perfect holiday meal for you and yours. To find out more, contact Poogan’s Porch at 843-577-2493. Their newly opened sister restaurant, Poogan’s Smokehouse, located on East Bay Street, will also be open for Thanksgiving with a more limited menu. These are definitely worth the drive downtown! Plus, you can spend the rest of the afternoon browsing through the beautiful city of Charleston.